Champagne and Cognac diamonds are naturally occurring diamonds, ranging in colour from a warm straw gold to a deep chocolate colour. Cut in any number of shapes and sizes, champagne and cognac diamonds are a beautiful option for a variety of diamond jewellery. The most famous champagne diamond ever cut was the Golden Pelican, a 69.93ct golden emerald cut champagne diamond, which was mined in South Africa. Mined at the Argyle Mine in Western Australia, amongst others worldwide, champagne and cognac diamonds were originally known simply as “brown diamonds.” These diamonds are the lower coloured gem quality diamonds mined in abundance in a number of mines around the world. Realizing the beauty of these diamonds, the Argyle Mine reintroduced these diamonds as Champagne and Cognac diamonds, resulting in an increase in demand. The term champagne refers to diamonds graded on the fancy diamond scale from C1 to C6, where one is the lightest colour and six the most intense. Champagne diamonds graded C1 and C2 are light champagne, C3 and C4 medium champagne, and C5 and C6 dark champagne. 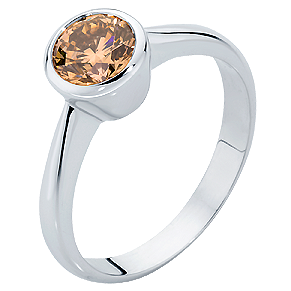 Diamonds graded C7 are considered Cognac coloured, as they exhibit the most intense, deep brown colour. As these diamonds are readily available, prices are fairly consistent with prices for white diamonds, if not slightly lower. When purchasing a champagne or cognac coloured diamond, it is important to look for diamonds with a cut grade of good or better, as well as a reasonably high clarity. These two factors will enhance the natural colour of a diamond and allow the champagne or cognac colour to appear vivid and full of brilliance.